Playson have brought a new lease of life to the classic style online slots UK game with this 5- reel and 5 pay line vibrant game, Sevens & Fruits slot. This slot has an estimated return to player of 96.31 so get ready to play and win some real cash online. This slot game is immediately eye-catching with simple yet beautiful graphics which are brightly coloured and stand out to catch your attention from the get-go. 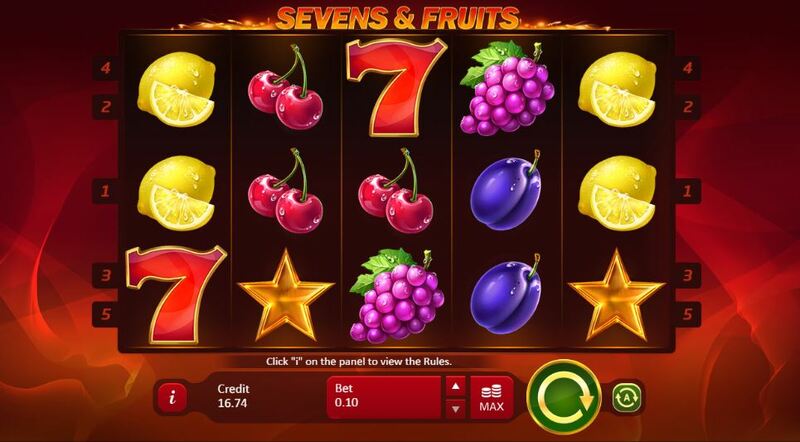 The reels feature some fruit machine classic like grape symbol, oranges, lemons, cherries, plums, watermelons, lucky sevens and stars, all in keeping with the theme. The fruits stand out on the reels, which are set against a deep red background and the simple audio keeps you focused on the gameplay. If you can’t wait to get started on this online slot, you can head to Easy Slots right away and start playing. Playson is one of the newer developers on the scene having only launched their business in 2012, but they have already been taking the industry by storm, releasing some super attractive and immersive games that players have been absolutely loving. The company is based in Malta and have over 40 games in their portfolio for you to browse and find your favourites. The company seems to be going from strength to strength as it gets to grips with the blooming industry. 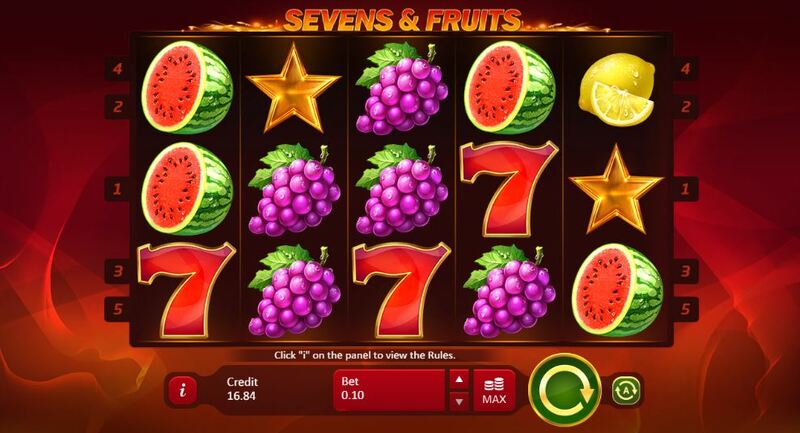 If you loved to play Sevens & Fruits casino slot game, why not check out some other great online slots games such as Playson titles, Alice in Wonderslots, Christmas Eve or Claws vs. Paws. The first symbol to be aware of in this Sevens & Fruits online slot game, is the star symbol. This symbol is representative of the scatter in the game and all wins with this symbol will be paid independently of the bet line wins. As Playson have decided to keep it very simple with this classic slot, there aren’t a lot of extra features or symbols but the sevens and fruits on the reels do offer you the opportunity to win some big prizes. The lucky red 7 symbol in this online casino game, is a very lucrative symbol and it you can manage to land 5 of these on the reels you will be set to make a massive 2500x your bet. That is definitely something to get excited about! Other symbols which will help you build up your wins are the water melon and the grapes which both pay out 150x your bet when you land 5 on the screen. All other fruits offer 60x your stake when you land 5.